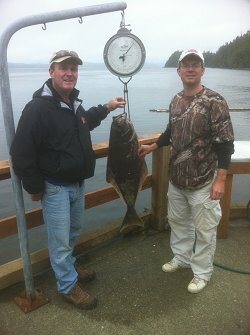 21st December 2012: FISHING REPORT: Port Alberni Inlet, Barkley Sound, Ucluelet (West Coast), Somas-Stamp River System. It is the Christmas Season and winters first day has now arrived. Port Alberni and areas out to the West Coast of Vancouver Island have been experiencing some of winters grip over the past week. Temperatures at freezing or just below have created snowy type days. Winter often can mean few fishing days due to poor weather conditions. Only those hearty enough to explore and fish the water in protected Inlets and Sounds along the shoreline of Vancouver Islands’ vast coastline get out on the water. This scenario could really be quite different as many boats have heaters and many of the harbor entrances and inlets on the Vancouver Island coastline offer protected waters to fish salmon and even some bottom fish. The majestic waters of Barkley Sound and the lower half of the Alberni Inlet and geographical areas close to the Ucluelet Harbor are very fishable throughout the winter season. Ucluelet in fact is one of the areas on the west coast that offers fishing 12 months of the year where it is very possible to hook into a 20 pound salmon. Other spots such as the Sooke Harbor and the Victoria waterfront are areas one can find a gathering of sport boats out on the water many days of the winter season. We are already looking forward to the 2013 summer season. We have been in a La Nina weather pattern for a few years. The pattern is ideal for salmon survival. It is the first eight months when the salmon fry head out to areas of the North Pacific that is crucial. With a La Nina pattern the water is at an ideal temperature and the rich food sources for salmon are excellent which means salmon survival will be quite high. With this in mind we are looking forward to future pre season West Coast Vancouver Island forecasts early in the New Year. 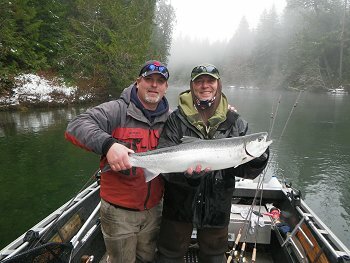 River fishing for Steelhead during the winter season is very popular on many Vancouver Island streams. The Somass-Stamp System is one of B.C.’s premier rivers and is world renown for Steelhead fishing. December through April is the Winter Steelhead fishing season with the peak often occurring in early to mid February. The season’s peak is often that time of year when the largest school of Steelhead enters the system. Don’t let winter be a discouraging time of year to fish as there really is a lot of opportunity on Vancouver Island which is British Columbia’s premier salmon sport fishing destination. 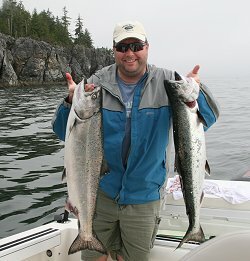 Winter Chinook trips to Barkley Sound also include prawn fishing. The Alberni Inlet during the winter months have some feeder Chinook swim up from the surf line and Barkley Sound. Bells Bay and the Nahmint-Franklin areas have some bait fish move in which will bring up some of the feeding salmon. A few local sport fishermen who spend a lot of time on the water are often fortunate enough to be on the water at the right time to take in some of this local fishing opportunity. The Inlet in the summer of 2013 should once again be very good for Sockeye Salmon fishing. Some of the early determinators in early pre season forecasts are showing returns equivalent to 2011 and 2012. The Sockeye fishery is a lucrative sport fishery to the Port Alberni community. This has been ongoing for just over 20 years. Sockeye at one time was strictly only a commercial fishery and continues to be one of the most important fisheries on the Pacific Coast. Sockeye swim into Barkley Sound from distant waters in the North Pacific beginning sometime in May of each year. The schools of Sockeye swim through the sound and up the inlet and enter the Somass River in late May. The early returning Sockeye swim in the top 30 to 35 feet of water and as the water in the river warms up they go deeper and begin to school in various inlet locations. Favorite Alberni Inlet Sockeye sport fishing locations are Nahmint-Franklin, the narrows, Underwood, Dunsmuir, the slide, and Cous Creek. Sockeye fishing is perfect for all ages and is very much a family fishing activity as the inlet waters are pristine and calm and Sockeye although sometimes difficult to land are reasonably easy to handle with a sport reel and rod. A few sport fishermen have fished Barkley Sound for Winter Chinook over the last few weeks. These Chinook are not migrating salmon and are classified as local salmon that remain in local areas and feed on the rich resources of bait fish (herring, needlefish, sardines). Winter Chinook can range from six or seven pounds to just over 20 pounds. The Winter Chinook season in the Sound usually occurs from January to the beginning of early May. The first weekend of March is often a peak time and is also the Sproat Loggers Derby weekend which is hosted out of Poett Nook. One of the biggest Winter Chinook landed was during the 2010 derby which had a whopping fish just over 28 pounds as a winner. When fishing for Winter Chinook or feeders which again are not migrating salmon look for slack tides and also shorten up on normal leader lengths when using hootchies. Summer Chinook hootchie leader lengths are often 42 inches in length and in the winter range from 34 to 38 inches behind a flasher. Leader lengths also depend on boat speed while trolling. When using spoons (Coyotes or Titans) behind a flasher, leader lengths are often four and a half to five feet in length. When trolling bait behind a flasher a good rule of thumb is to have five to six feet of leader. The Winter Chinook that have been recorded to date have ranged from seven to ten pounds with most landed around the Swale Rock, Vernon Bay and Canoe Pass area. The salmon are in deeper water, ranging from 100 to 140 feet depending on where the best fishing is occurring. Hootchies, bait, and coyote spoons in a three and a half or four inch size are popular. Nasty Boy, green-glow, green nickel, blue nickel and Cop Car coyote spoons are often a good choice to have in the tackle box. Green glow flashers and purple haze flashers are often a good choice when fishing with plastics, spoons, and bait. 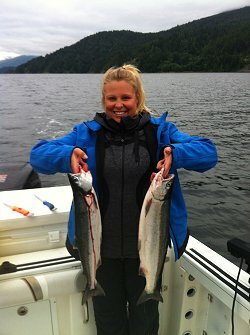 Ucluelet is a great sport fishing destination for 12 month of the year. Of course this area is also known for winter storm watching, making days from November through April where one cannot get out on the water for safety reasons. There are many areas close to the Ucluelet Harbor that sport fishermen and charters boats can get out to for Winter Chinook fishing, pawning and crabbing. The lighthouse, Mara Rock, and Great Bear have been reliable areas over the years and on those days that one can fish we have had some favorable reports to date for some nice feeders from eight to twelve pounds. The area has plenty of needlefish. Guides have been using needlefish hootchies in green and blue. Like other areas along the coast the feeders are actively feeding and are not migrating. The salmon are in deeper water and besides hitting the needlefish hootchie they will hit anchovies behind flashers. Some hootchies worth having in the tackle box are an army truck, tiger prawn, Purple Haze, green glows, and a green spatterback. In the early to late spring we offer our adventurous seafood safari. This is a majestic trip and at the end of the day a seafood dinner of salmon, crab, prawns, and rock fish with some great B.C. wine is a fine ending to a delightful day on the open Pacific. The migratory flow this summer in early season predictions looks very good. Like the last few years some of the best fishing will be from early June to the middle of August. The 2012 season for Summer and Fall Steelhead was very good. The Winter Steelhead are now entering the system with most in the Lower River and a few mixed with the big numbers of Fall Steelhead which are still in the Upper River. Those walking the river have not had an easy time hooking into fish. The water is still a bit high but the clarity until recently has been very good. The best fishing has been aboard jet boats in terms of action and success. The weekends have been the busiest times on the Stamp. Weekdays have been fairly quiet. The Stamp River is located close to Port Alberni on Vancouver Island. The Stamp is a river that has one of the most consistent salmon and steelhead fisheries in the Province of British Columbia. In the fall Chinook and Coho returns on average range from forty to fifty thousand. Sockeye, Coho, and Steelhead have similar life cycle. All three species spend at least one year in fresh water before heading somewhere out into the northerly portions of the Pacific Ocean for two to four years. The summer of 2011 and 2012 had strong Sockeye returns with over eight hundred and fifty thousand returning each year. Coho returns were just over forty thousand. The Summer-Fall Steelhead returns were very good. There continues to be good numbers of Fall Steelhead in the Upper River. With these factors in mind the Winter Steelhead return should be quite strong. This fishery can often last right to the end of April on the Stamp River. The Stamp River can be divided into three sections. The lower river is below (the bucket) the girl guide rapids. This is the area after the 15th of September to the 30th of April that fisher people can use bait. Above the bucket only plastics or imitations and imitation egg patterns can be used. The midsection of the river is from the bucket to Stamp Falls. The Upper River is just above Stamp Falls. Beginning on January 1st the area from the mouth of the Ash River to the dam or the Great Central Lake outlet will be closed. The closure is to protect the Summer run Steelhead that are spawning. It is most important that Those fishing Steelhead on the Stamp retain only hatchery fish and that there is a maximum of two hatchery Steelhead per day. 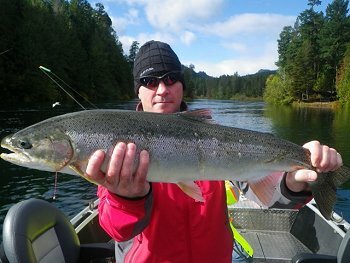 Guests fishing the lower river have had some success on the early Winter Steelhead. Those fisher people still fishing in areas termed the upper and some areas of the mid river are also still having some successful outings.. The use of bait below “the bucket” has had some great results. The use of roe and roe bags has been great. In the Upper Stamp areas spin-n-glows and corkies in pinks and red have been good. Some individuals have been using trout beads with success. When the river becomes high and the water much darker a switch to Pink Worms is best as they produce some better visibility. We are really expecting the steelhead fishing for winters to be rather spectacular in terms of returns. As mentioned, great returns of summer salmon (sockeye) often mean that steelhead returns in the fall and winter will also be quite good. The Winter Steelhead run often runs from now right to the end of April. Fishing the Stamp for Winter Steelhead can be a fantastic adventure and is in a very safe environment when fishing with guides who have many years of experience on the Stamp River----British Columbia’s premier Steelhead river.